How to replenish some lost nutrients over time? Our garden has been in the same spot for the past 10+ years.We've always grown tomatoes and for the first few years green beans too.Then we switched to cucumbers and dill.And about 6 years ago we started rotating the crops.We add manure,top soil,and some compost.Maybe we need to till it in more?But for the past few years it seems we've been harvesting less and less cukes. Last edited by applestar on Sun Jul 26, 2009 4:51 pm, edited 1 time in total. Two years ago, I began an experiment that is now demonstrating success. My entire yard, which was probably once a business, is covered in 8" of small river stones that have become covered with silt and compacted over time. Because of utility lines, I built my front beds on top of the rocks. 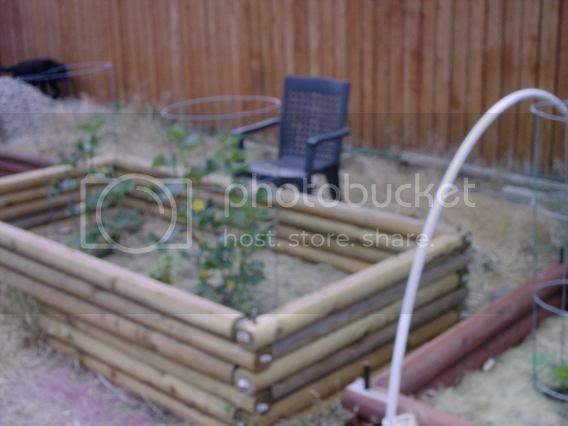 The backyard, however, has become a major project in which I measure out a bed, remove the stones using a rock hammer, sift the top soil from them, and use that top soil as the base for filling the raised beds I build in the cleared area. Filling the beds will take decades. (My "raised" beds begin at minus 8" once I have removed the rocks ) Each summer, I begin excavating a new bed, adding its amended sifted top soil to ones started in previous years. I'm greedy, though. Like you, I can not leave a perfectly good bed fallow, so I grow veggies in the beds while I add soil to them and continue to amend the old soil. Excavation and soil preparation was finished in early July, so I decided to quickly put in some peas in what was then an anti-raised bed. I raked the soil to each side, making two 1' wide rows down the length and leaving a 2' wide, 6" deep depression in the center, a depression I filled with grass clippings. As I worked on the next bed, I poured amended top soil on the grass clippings and more grass clippings on it and layering it upwards. Amazingly, no matter how much I added, the pile never went higher than the rows. The peas didn't mind the extra heat as the center of the bed composted; by the time the composting process began in earnest, the temperatures had seriously dropped. I actually think I wound up extending their growing season--I got peas until November that year! The next year, I put tomatoes in this bed. To continue the experiment, I turned only the two rows in which the peas had grown, planting my tomatoes in those rows. This time, I filled the center with partially finished compost. Whenever it began to settle, I refreshed it with a layer of soil and a layer of partially finished compost. This year, in my scramble to get my own garden in after finishing my cousin's, I completely spaced out this experiment. When my front squash had not germinated after three weeks, I ran to a nursery and bought two peat pots of very sad, very leggy, very pale cucumbers. I brought them home only to find that the squash had finally decided to come up. Stuck with two pots of cukes, I just plugged them into the center of this bed, thinking it was a waste of space for such miserable looking plants, but too busy to really care. About a week ago, it occurred to me that these cukes were the most gorgeous emerald color and covered with cucumbers. I remembered then that this was my experimental bed. (I've always got one or two experiments going on at my place!) It's a rare cloudy day in Wyoming, so the color on the photo doesn't do these guys justice. If you want, I'll get you a better photo tomorrow. Anyhow, long story. Sorry. Based on this experiment's success, you might consider trying something similar. If you were to alternate rows with composted pathways each year, you might be able to continue using your bed without leaving it fallow. Merely layer soil and organic, use spaced stepping stones so you don't compact it by walking on it, and next year, garden in the previous year's pathway while composting the old rows. It's a germ of a thought, anyway. The more compost, the better, in my opinion! Thanks you two.Should I also add blood meal in with bagged soil mix on top?Stella,we also have three small containers that we plant flowers in and have never added fresh soil each year to them,but do you think I could start amending some soil in there?Unlike the veggies,I don't think the flowers take up as much of the nutrients.So maybe that soil will be better. Based on your posting, I would say your plants are telling you two things: 1) You've got extraordinary base soil, if you are only now seeing a deficiency. Lucky you! 2) Your plants probably want an overall replenishment of nutrients, something they can get with lots of quality compost. I like Applestar's emphasis on fall preparation; that's the time to get your soil ready for the next year. Regarding the flowers, when I do container gardening, I refresh my soil each year, dumping it out, adding great stuff to it, and putting it back in. I'm not much of a flower person, though, so I will leave that question for someone who is seriously in the know! No doubt about it, the best way to replenish nutrients in your soil is to add compost. If you aren't already composting, start your pile NOW. By spring you will have tons (well not literally, depending on what all you have to put in your pile, but buckets and buckets) of good rich organic material to add to your soil. If you are growing small scale, you don't need to till it in (tilling messes up your soil biology and chops up earthworms), just trowel it in. Put some in the planting hole when you put plants in. Put some on top of the soil for top dressing/ mulch. Cuke wrote: Should I also add blood meal in with bagged soil mix on top? I swear by blood and bone and spread a thin layer about 100mm below the surface for everything (try to source an organic variety). Like Rainbowgardener, I work in TONS of compost, and I compost while they grow, too, double and triple layering my mulch with 1" of soil between each layer. As the mulch is depleted, I layer again. I just did the front beds for their second time. I also like to alternate liquid fertilizers, something different each week, so the plants can pick and choose what they might want out of each, sort of like a plant buffet. One week is fish emulsion concentrate; the next week is seaweed concentrate. I recently learned how to make compost tea, so next year that will go into the fertilization routine. In the early spring, when I am turning the soil (with my spading fork ), I work in other things besides the compost. Like SP8, I'm a fan of bone meal. I'll also work in kelp meal and maybe a good organic pelleted fertilizer, like Alaska King. I don't know where you're located, but in my opinion, west Washington state has the GREATEST organic fertilizers. Whenever I visit my family there, I fill my trunk with goodies. Brand new soil gets peat moss and perlite, too. I'm a fan of peat moss for conditioning the soil--I'm betting roots and worms think it feels like satin--and perlite is an old standby for enhancing water retention. Anything you can do to help your soil will help your plants. Hey, with a name like "Cukes," maybe you can tell me what to expect from those cucumbers of mine? I plopped their peat pots in that bed, thinking they would spread and produce in hills. Three weeks later, the little guys looked very unhappy, still standing stiffly upright, like confused little soldiers, blindly thrusting tendrils out to find something, anything to hold on to. So, I took the hint and gave them tomato cages. Now they are topping the cages, so I suppose I will need to stake them with 8' green poles, right? They are called Slicemaster. They were on sale for half-price; it was that late in the season. I generally grow bush cucumbers; these fellows are strange creatures! Of course I add compost, but this year I'm experimenting with a mixture of cotton seed meal, kelp meal, blood meal, bone meal, lime, and ironite. It will likely be next season before the chemical fertilizer leaches out and I know how good the concoction is working. Also may consider some fish meal in the future. I guess I should have been more clear about the compost,my bad.We don't make our own but we usually buy some bags of it at some stores.My city has there own compost brand so it's all local.And I don't have a tilling machine (my garden is 10x8) so we just have a garden rake and a shovel to break up large chunks of dirt.We don't get too deep either,maybe 3 inches at the most. Stella-Yes,stake them with poles now,but be careful of their roots.I just put poles wherever they're climbing to.I made the space for cucumbers so if they want to vine out they can,or if they want to climb I give them poles.I try to train mine onto poles,but they're so stubborn sometimes. Hendi-I'm curious to see how that ironite will turn out. SP8-The stores don't carry bone meal,does that have Nitrogen too?I'm pretty sure the store I get most of my gardening stuff has organic blood meal.I'll double check though because I don't want a lot of chemicals in my garden. Several of you are saying kelp and fish fertilizers work well.Only one store where I live carries a small package of fish emulsion.Should I get that?If it comes down to it,we could buy some from a website. I think I'll do some lasagna gardening,that way it will be similar to composting in that we add what we want to and it breaks down.We have plenty of leaves,twigs,and then plant roots.And should I cut the leaves and roots into small pieces? And one last question for this post.Would it be too late to add some blood meal to my cukes? I see you are in Midwest, US. Try your local Home Depot for your fish emulsion; that's where I get mine. If they don't have it in stock, they should be able to special order it. As for the kelp meal, I bought two large bags of this in Washington State when I was there in 2006. I've still got about 3/4's a bag left--a little kelp meal goes a long ways. The big cost on amendments is often shipping, so whenever I visit someplace a distance away from home, I always check out the gardening centers. Different locations stock different amendments, and you never know what you might find hidden on a dusty back-room rack! I read some of that topic,sounds great!Do you know the measurements for using a one gallon milk container?We don't have enough room to store a fish tank,but can easily fit the gallon somewhere.That sounds like good stuff,especially if it helps the cukes. I'm glad your cukes are doing well.A few vines have reached my tomatoes,but they seem to be coexisting peacefully for now. The Home Depot sounds good too.How much did it cost for the fish emulsion?At the other store it was like $9 for this tiny little thing. Scroll through the "Aerated Manure Tea" link, and you'll see top_dollar_bread's photo demonstration. You only need a five gallon pail with a lid, something most of us have on hand, and the $10 worth of aquarium stuff. Once you're done making the tea, you wash the brewer (pail, lid, and apparatus) and shove it in the shed. Like you, I was thinking it would all be something terribly elaborate and terrifically expensive, based on what I had read. I was wrong. What's too cool is that you can use all kinds of good stuff in it. Note to SP8: If you are reading this, could Cuke put blood meal in his tea? I mean, would it dissolve? As for the fish emulsion, I think that costs around $12 a gallon, but I can't remember for sure. I generally only use one gallon per year on my 240 square foot garden. Now that I am making compost tea, I believe one gallon will last me two years. I store it in the basement, someplace cool but not freezing, over the winter. Once you've made the initial $10 expenditure on the aquarium equipment, you can use virtually any quality organic food in the compost tea-maker, well, anything that will dissolve, basing the ingredients on what your plants require! Unfortunately,we only have the garage for storage space,and that's running low.But I shall scroll through it soon.I'll look into the aerated tea compost more,it does sound cool,especially since you can add your own stuff to it. I did buy organic blood meal today.I also found bone meal,but bone meal is phosphorous and I don't think I need that yet so I didn't buy it. That fish emulsion sounds good for the price.Like I said,the stuff at my store is probably like 2 cups in this small package and it's $9.I might buy some fish emulsion from a web site,I'll just see how next year's garden looks after doing the lasagna gardening for the first time. If you're in the Midwest, you don't need bonemeal now, anyway. It takes 14 weeks to degrade, so I put it in my compost pile, work it into new gardens I am working on for the next year, and add it to my gardens in the spring.